Want to make something delicious for yourself or friends without too much fuss? Time to try this fantastic antipasto. 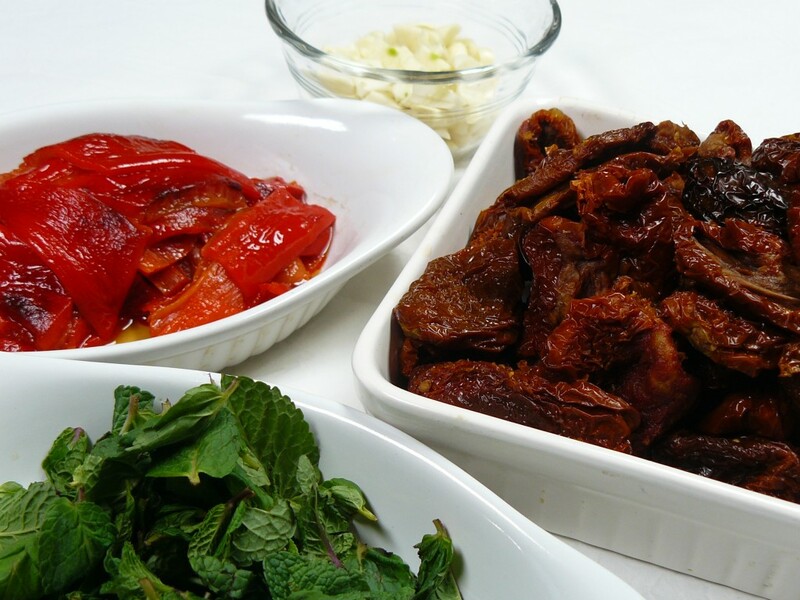 It’s a great way of using sun dried tomatoes and roasted peppers for use days, weeks or even months later. It’s pretty tasty though so your jars of this stuff probably won’t last that long. It can be eaten as a party nibble but it’s also great in sandwiches, as a side dish with almost anything, in salads and stirred into pasta. It’s really easy to make – it’s basically just layering the right ingredients in nice jars – but delivers big-style on flavour. Our lovely friend, Giorgia, who showed us how to make it, calls it ‘bottiglia pomodori secchi con peperoni arrostiti e aglio’ or something along those lines (she obviously doesn’t use Google Translate like I did so there may be a grammatical error or two in my version!) It sounds much better in Italian, of course, but it tastes wonderful whatever language you use to describe it. You need to leave it for a couple of weeks to let all the flavours blend together; this is a dish that becomes about a million times more than the sum of its parts but you have to be patient and wait for it. You’ll need several clean jars (instructions on how to sterilise them are in the recipe below). Drain the sun dried tomatoes - keep the oil! 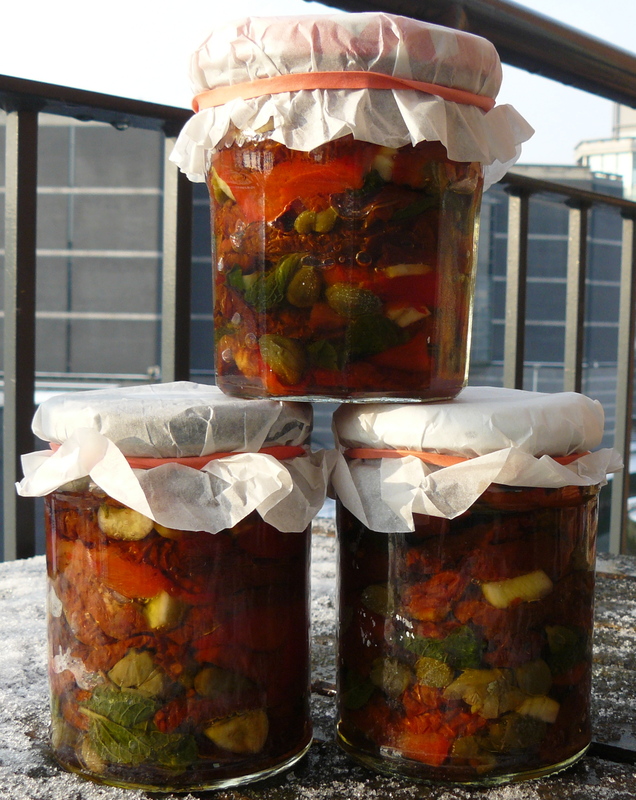 Sterilise your jars and leave them to cool. To do this, wash them thoroughly in hot, soapy water. Then you can either place them in a cool to moderate oven (about 150C / 140C fan / Gas 2 / 300F) for about 20 minutes OR run them on a short, hot cycle in the dishwasher OR pop them in the microwave, slightly damp, for 1 minute. Put the lids in a bowl and cover them in boiling water. Roast the peppers and leave them to cool too. Slice them roughly. Set out all of the ingredients in separate dishes (makes it much easier to get an even mix of them) then start layering them in the jars. You can make this as random or as ordered as you like. It will all taste the same in the end! 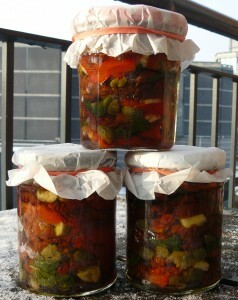 Press the contents of the jars down with a fork occasionally to pack as much into them as possible. When they're just about full, pour in the oil from the sun dried tomatoes and some olive oil until the contents are just covered. Keep turning the jars and pressing the contents to prevent too many bubbles forming. Don't worry about a few bubbles though - they're part of the charm and won't spoil the flavour. Screw the lids on tightly and store in a cool, dark place for two weeks before opening. The antipasto will keep for 3 months unopened. Store opened jars in the fridge (note the olive oil will start to solidify in the fridge - just bring it back to room temperature and it will turn to liquid form again). I used to make huge jars of sun-dried tomatoes and capers when I lived in a small town in Italy. There was a proper alimentari shop that had huge baskets full of dried tomatoes, figs, all sorts. It’s gone now, sigh. But I’ll try to find some. If you can bring a big bag of sun dried tomatoes back from Tuscany, I’ll anti-pasto you to the max!